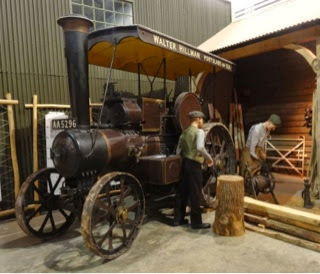 Last Sunday we took a trip down memory lane and visited a really fascinating recreation of life as it was during my childhood. 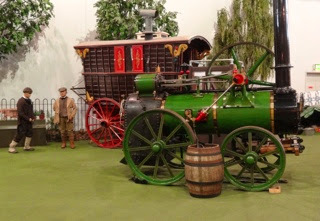 Val, my young friend and I were paying a visit to Milestones - a collection of shops, buildings and vintage vehicles all under one roof near Basingstoke. 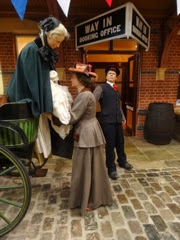 As we entered the museum we bought ration coupons and an old penny to spend in the sweet shop there. 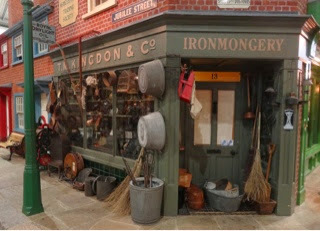 This was the ironmongery shop. The tin bath hanging on the wall reminded me of our tin bath which hung outside our kitchen wall in the forties, (and was brought in every Friday evening for the whole family to have our weekly bath - filled with hot water from the copper). 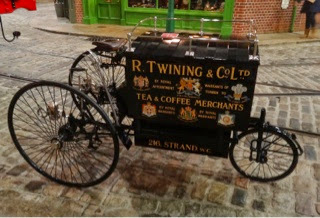 And round the corner we spied a mangle. 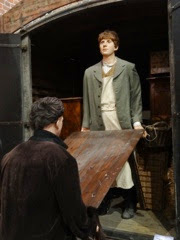 (My job as a small boy was to wind the big handle to squeeze out as much water as possible from the freshly washed clothes). 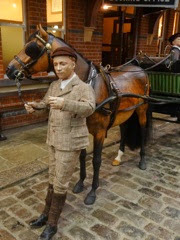 Of course most of the things we saw at the museum were completely alien to my young friend - the gramophones, trams, old buses, horse-drawn carriages, etc. 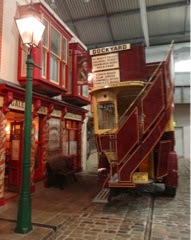 So many interesting vehicles there - all in immaculate condition - from steam engines, trams to bicycles. 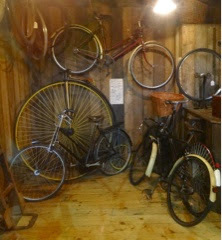 The bicycle shop was great. 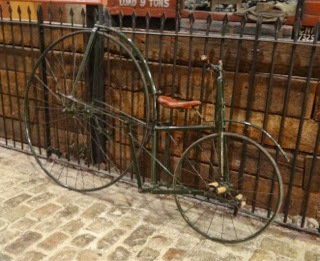 Apart from a couple of penny farthings I saw a bike almost the same as my old Rudge. And amongst the collection of vintage lights and bells was a three colour lamp. 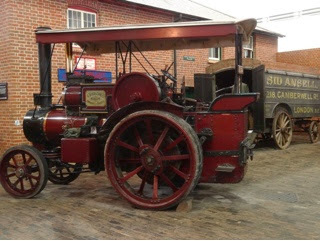 Mine was not only three coloured (big white at the front with smaller side lights of red and green) but it was fuelled by paraffin! Sounds almost prehistoric doesn't it? Anyway this is the shop. 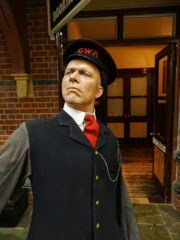 Some of the wax figures were so realistic I was quite taken in from time to time. And was even waiting for one of these men to finish loading so I could look into the vehicle - until the penny dropped. These two scenes were just outside the railway station. 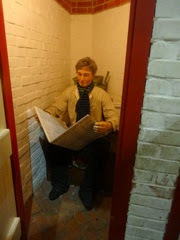 When I opened a door in one of the alcoves I was afraid I'd disturbed a man in his privacy. 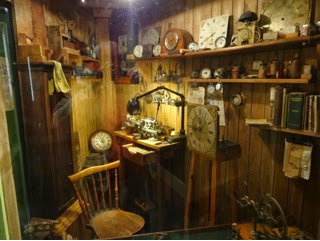 This scene from the watchmakers workshop could be the inspiration for a new painting. The watchmaker who inserted a real watch into one of my paintings often asks to be included into a painting so maybe the time has come. I told him I'm waiting for him to get older, craggier, and for his hair to grow longer before I include him into a painting. The train's getting going so we'll say goodbye too. Our local theatre in Wargrave produce some wonderful performances. 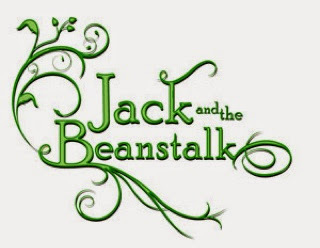 This winter the Wargrave Theatre Workshop put on yet another memorable pantomime - Jack and the Beanstalk. If you don't book your seats within the first two days of the box office opening you miss out. Luckily my young friend and I got second row seats for last Saturday's performance. They were the only two left. Directed by Emmajane Hughes we really enjoyed another outstanding production. When Rancid the Rat mimed to Elvis Presley's 'Devil in Disguise' his pelvic thrusts and grinds made the audience squeal with delight. And as his long thin legs were encased in a tight fitting pair of black trousers/tights my young friend remarked there was no mistaking which way he dressed! The doddering, dithering King Hubert and his long suffering Queen Hyacinth were great as a pair of Royal relics. Seven performances, and every one a sellout. A great show. 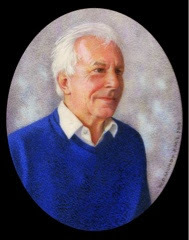 I'm busily painting away at a few miniatures for exhibition at the Hilliard show in Wells in late spring, and for the Royal Society of Miniature Painters in the autumn. I always endeavour to have a few non-commissioned miniatures ready for these exhibitions. This is one I've just finished of my cousin Paul Carter. When I woke up this morning the world was white with snow. My car slid around on the slope and I nearly slid back to where I started, but finally with a lot of gear manipulation arrived at the top. I was on my way to pay my Saturday morning visit to my friend in Bray. Her husband, my artistic friend, rang through as I was there. He's working in the prison workshop and is making a pencil box. Hope he has a chance to use the pencils soon.